Sikkim, located in the eastern, Himalaya, sits between Nepal and Bhutan, while to the north lies eastern Tibet. The North Sikkim Trek is a high altitude trek with the trail leading through mostly alpine vegetation consisting of beautiful alpine flowers and plants of medicinal value only the first 2 days of the trek is covered with forest area consisting of mainly of different species of Rhododendrons, Silver Fir. There are no villages, lodges or trekkers hut along the trails, it is a purely camping. At places temporary bridges have to be built across rivers as there are no permanent bridges along this route. This trek offers very close and majestic views of Mt. Kanchendzonga; Mt. Spinach considered one of the most beautiful peaks in the world, Mt. Simon, Tent Peak, Nepal peak, the Shorten Mina Range and few more. 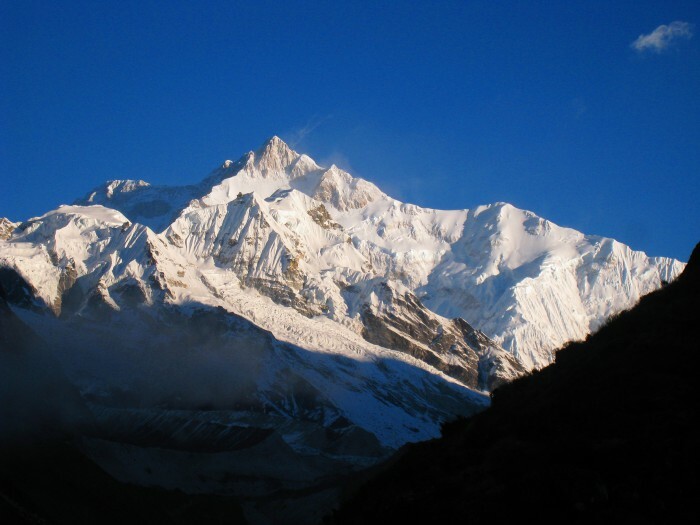 Please note that for North Sikkim High Altitude Trek we need a minimum of 04 pax to obtain the trekking permit and we suggest that the maximum number of pax should be 12 which will be good for the group. Clients Bio-Data, passport and Valid Indian Visa details along with 4 Nos. of passport size photographs has to be submitted to us 2/3 months in advance as the permits for North Sikkim is processed by the Ministry of Home Affairs and Ministry of Defiance, New Delhi. DAY 13: Trek Theu la (5212m) O/N camp.